INDIA is in "imminent danger of losing a large part of its productive lands through soil salinisation", says N T Singh of the Central Soil Salinity Research Institute in Karnal. Soil salinity is natural to the subcontinent, points out Singh. Even in ancient India, in the period between 2500 BC and 600 AD, soils had been classified as urvara (fertile) and anurwara (sterile). The latter were divided into usara (saline) and maru (desert). But since the middle of the last century, with the growth of irrigation, soil salination has emerged as a major threat to agriculture. 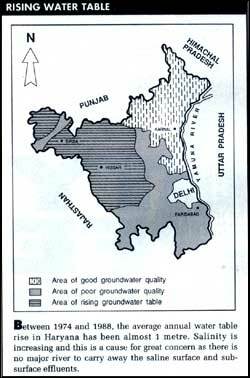 Source: N T singh, Dry Land Salinity in the Indo-Pakistan Subcontinent. Large areas irrigated by canals face both waterlogging and salinity. In the Gang and Indira Gandhi Canal command areas, the annual rise of groundwater has been 43-83 cms. Scientists at the Central Arid Zone Research Institute in Jodhpur estimates 60 per cent of these command areas of will develop drainage and salinity problems in 100 years.